Mario Balotelli scored twice against Udinese, including the winner with the last kick of the game, as he made a successful start to life at AC Milan. The 22-year-old striker completed a £19m move to the Italian side from Manchester City on Thursday. Balotelli was only included in the team at the last minute after Giampaolo Pazzini was injured in the warm-up. But he wasted no time making an impact, putting his side ahead before converting a penalty to earn a 2-1 win. The former City striker got his career with his new club off to a flying start at the San Siro when he turned home Stephan El Shaarawy's deflected cross early on. The Italian almost doubled his tally soon after with a dipping shot that Udinese goalkeeper Daniele Padelli turned over the bar. 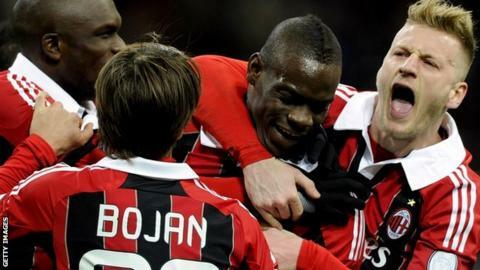 Gianpiero Pinzi pulled the visitors level after half-time but the stage was set for Balotelli when AC Milan were given a penalty deep into stoppage time. Udinese defender Thomas Heurtaux was adjudged to have fouled El Shaarawy in the area and former Inter Milan forward Balotelli sent Padelli the wrong way with his low spot-kick after a stuttered run-up. Balotelli scored 30 goals in 80 appearances for Manchester City following a £24m move from Inter Milan in 2010 but he left Etihad Stadum at the end of the January transfer window.